방콕, 태국의 앳 카오산 호스텔 | 호스텔월드에서 예약하세요. 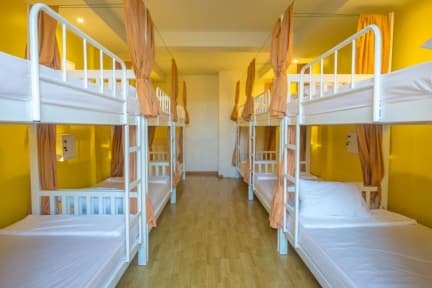 We are family, with worldwide travelling experience and At Khaosan Hostel also have resort in Kho Phangan (land of Full Moon Party) with an ambition to build a hostel where travelers like you can enjoy a friendly around in an urban setting. Our hostel is made for travelers by travelers. We are ideally located in the heart of Bangkok's old town. The surrounding neighborhood is flourishing as the new hip spot in Khaosan. A walking distance to packed Khao San Road, add 3 minutes and you will marvel the amazing Grand Palace, the incredible Wat Pho and the iconic Chao Phaya River. That's why we are called At Khaosan Hostel. We have 3 dorm rooms, 3 private rooms and a bar which named after day of the week. All rooms are equipped with air-conditioning. The wi-fi is free of use. We provide laundry facilities, tour service and many facilities. You will enjoy staying with us. 딱 하루만 묵고와서 잘 모르겠지만 가격대비 좋은 숙소였던것 같네요. 침대에 커튼도 있고 숙소도 깔끔했던것으로 기억합니다. 굳이 쓰자면 화장실이 조금 깔끔하지 못했고, 에어컨이 오후 8:30 부터 가동해서 좀 불편할수도 있겠네요. 우리가 묵었던 방이 2인실 창문딸린 방이었는데 갔을당시 창문수리중이어서 창문을 아예 막아놨었다.. 빛이 안들어오니 마치 고시원느낌이 났다. 창문밖풍경을 기대했었는데 상당히 아쉬웠다. 가격이라도 덜 받아야하지않았을까 생각도된다. 그외 직원들은 친절했다.